This granola is an absolute staple in my house, but I have to make a double batch or else it doesn’t last for very long! It is a great alternative to those shop-bought cereals that are high in refined sugars. It actually helps stabilize blood sugar levels due to its high fibre and protein content. With one serving providing 12g of plant-based protein, it’s amazing to think that enjoying a bowl of granola for breakfasts gives you the same amount of protein as eating 2 eggs! Without obsessing too much about quantities, my general rule of thumb is 3 cups of oats/flakes, 1 cup of various nut/seed combinations and ½ cup dried fruit. If you think of it in this way, then you won’t get bored and it gives you a greater nutritional variety as opposed to having the exact same breakfast every day. For example, I tend to rotate between regular wholegrain oats, buckwheat flakes and quinoa flakes as the base. With the nut/seed combo, I normally switch up the following ingredients depending on what I have lurking in my cupboards at the time: flaked almonds, walnuts, cashews, hazelnuts, pumpkin seeds, sunflower seeds, sesame seeds, hemp seeds, flaxseeds and buckwheat groats. And with the dried fruit, I swap between goji berries, mulberries, chopped dried apricots and dried figs. All of the different elements bring a varied but equally valuable nutritional profile to the table. I also change up the powders, sometimes I use turmeric, but other times I use cacao, ground ginger or cinnamon. As much as I cook with turmeric (my hands are stained yellow on a daily basis), unfortunately, my kids just don’t care for the taste. So I was able to ‘hide’ it in this deliciously roasted granola and they can’t tell at all. Turmeric has really earned its crown as the Queen of all of the spices. It’s high antioxidant content and anti-inflammatory properties have shown some incredibly promising results in cancer prevention and even as a supplement to treatment. So all in all, a pretty great way to start the day! It also works brilliantly as a mid-afternoon snack sprinkled on top of some yogurt when the inevitable sugar cravings arise. NOTE – I have been experimenting with various so-called healthier sugar alternatives and in doing so my quest has lead me to use Yacon Syrup. Yacon syrup is extracted from the roots of the Yacon plant. It has a low glycemic index and is much lower in calories than traditional sugar, which makes it a great choice for diabetics or those looking to cut down on their sugar consumption in general. It contains something called fructooligosaccharides (FOS), which acts as a prebiotic that supports the growth of beneficial bacteria in the gut. I'm fairly new to using it, so if any of you have any experience with it (good or bad!) then please let me know! 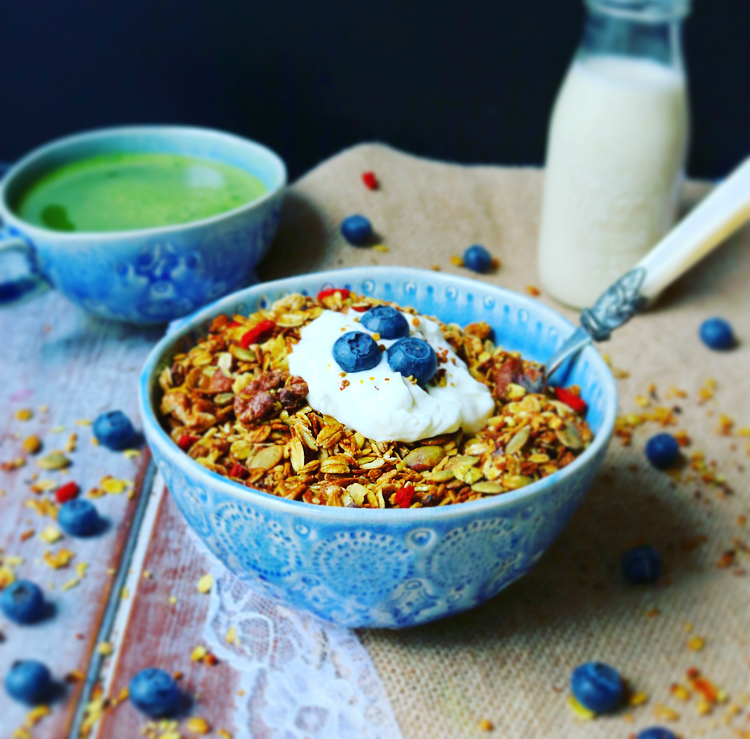 · Mix together all of the oats, nuts, seeds and buckwheat groats. and distribute evenly between 2 roasting dishes. · In a small saucepan, add the water, syrup, coconut oil, turmeric, cinnamon and a small amount of black pepper; and heat for 5 minutes. · Spoon by spoon, pour the liquid over the nutty oat mixture, and combine well, making sure that it is all coated. · Cook in the oven for half an hour or until brown and nicely toasted, mixing frequently to prevent burning and to create an even colour. · Once cooled, add the goji berries and mulberries and store in a large airtight container. · Will keep for 3 weeks.